Four years ago, in the Spring of 2014, I was anxiously awaiting the first Prairie Songs. It was my second semester as an undergraduate student at the University of Montana, and I was in my first of the two internships I would eventually hold with Camas Magazine. I’d enjoyed my work as an editor with Big Sky High School’s literary magazine Aerie, where I’d helped coordinate and host some reading-oriented fundraising events in the Missoula community. When I started at Camas, I was eager to work on similar projects, and also to collaborate with the coeditors at the time, Caroline Stephens and Melissa Wardlow. As soon as I started, we began brainstorming ideas to create a new Camas event that spring. I watercolor painted a Camas flower and made a poster for the event while Caroline and Melissa reached out to local authors to read. We sat down together and thought of what we should call our event, finally settling on "Prairie Songs: an evening of Montana reading, music, and celebration." After a semester of brainstorming and coordination, we secured the Top Hat as our venue and confirmed the line-up of eight incredible local authors including David James Duncan, Annick Smith, and Richard Manning. Our goal was to create an event that would continue into the future and widen the community surrounding and supporting Camas. When I first starting working with the magazine, the community felt relatively small. Not many people in Missoula seemed to know about Camas, and our Spring reading series, Wild Mercy, always seemed to draw in the same crowd of Environmental Studies students and their friends. I really wanted to change that. Creating an annual community event where people would come together to support the wonderful work of Camas and the extraordinary writing community we are lucky to be surrounded with in Missoula seemed like a great way to do it. The first Prairie Songs was, in my somewhat biased view, a raging success. The Top Hat was packed full of people, and audience members laughed and cried in the same night - always a sure sign of a good event. To this day, my mom and I still often bring up Bryce Andrews's Weiner Dog Tale, which left the audience laughing so hard they cried, myself included. I remember looking around while he told his story and realizing what a powerful event we’d created. I realized that not just Camas, but the Missoula community needed this event to continue into the future. I’m happy to say that Prairie Songs was not only a success in 2014, but has been an annual success ever since. It’s been wonderful to return to this reading every year and see how the community surrounding Camas continues to expand and widen. 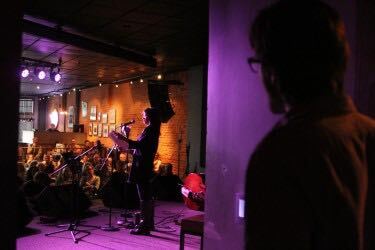 Events like Prairie Songs are important in their capacity to connect our community. When we can appreciate a story together under the same roof or around the same table, we can begin to appreciate each other and the environment and community we are a part of. This year, Prairie Songs will be held at Western Cider and we will once again get to hear the stories of David James Duncan and Richard Manning. Prepare yourselves for tears and laughter and a night to remember. Really, what could be better than drinking cider, eating local food (a $10 donation at the door will get you some local soup, bread, and the latest issue of Camas) and hearing two of Montana’s best loved writers read you stories? I hope to see you on May 3rd at 6:30 for the fifth year of Prairie Songs. It’s an event you don’t want to miss.